SmartFace is a high-performance, scalable, face recognition server platform able to process multiple real-time video streams in parallel. Leveraging Innovatrics’ industry-leading algorithm, SmartFace allows system integrators to easily incorporate face recognition into their solutions. Rapid deployment, with no biometric skills required. Save time and cost. Developed listening to requirements from the field, SmartFace solves the typical problems associated with face recognition SDKs such as lack of specialist biometric expertise, long integration times, and problems working with video files, multiple IP camera streams. SmartFace is by design easy to integrate, potentially saving hundreds of man-hours and dramatically shortening ROI periods. Monitor large groups of people and rapidly identify potential security threats at airports, public gatherings or sports arenas using real-time face detection and blacklist check. Provide a safer environment for your employees and visitors by using facial biometrics to control access and accurately monitor individuals on your premises. using facial biometrics to provide demographic information. frequency, conversion rates, seasonal trends, and outliers. return customers and reward the right ones accordingly. Detects and tracks faces fast and accurately in multiple video streams. Easy-to-configure watchlist management through REST API and GUI. Quickly identifies faces from watchlists; designed to send automated real-time alerts. 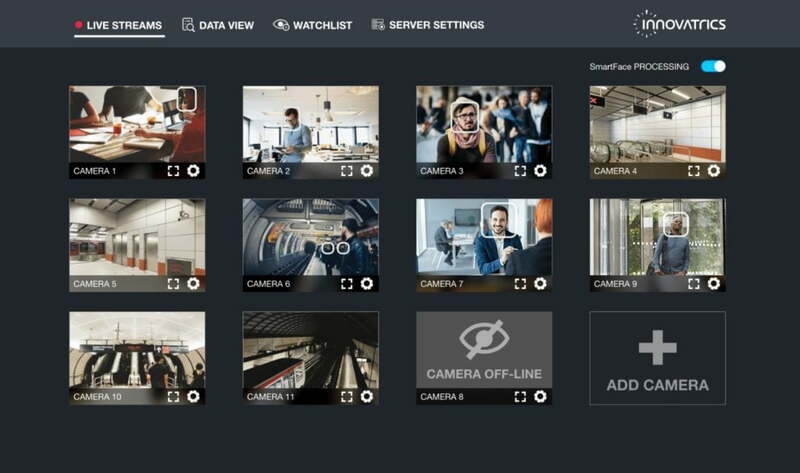 Manages multiple camera streams per server without compromising speed or accuracy. Estimates age and gender, augmenting people counting data with advanced demographics. Operates with wide range of IP cameras and server platforms. Innovatrics face recognition technology, IFace, is a top performer across all categories in NIST Face Recognition Vendor Test (FRVT).